CEDAR PARK, Texas – Cody Webster looks at Sunday’s Bullfighters Only Cavender’s Cup victory a little different than most champions. 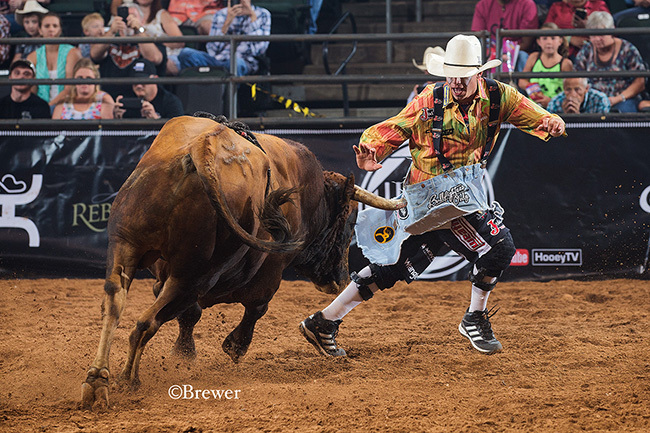 The Cavender’s Cup featured the top 15 bullfighters in the game all competing in a major league freestyle bullfight. Matched against aggressive and athletic bulls that have been bred for this type of fight, the men were able to showcase their abilities to the fullest. Webster just happened to be the king of the mountain inside the HEB Center at Cedar Park. By winning his preliminary go-round, he advanced to the short round, where he and his bull danced across the arena dirt for 88.5 points. That score was matched by Weston Rutkowski of Haskell, Texas; Webster claimed the title by winning the tie-breaker, which referred to the highest bullfighter score. The event featured five three-man rounds, with the round-winners advancing to the championship. Scores from the preliminary rounds were then thrown out, and the top scores earned the lion’s share of the prize pool. The bullfighters were also matched with animals that had not been in a bullfighting arena before. “I like that concept,” Webster said. “It comes down to the bullfighters score because the bulls should be pretty evenly matched. The earnings will push Webster into the top three in the Bullfighters Only world standings. That camaraderie is the backbone of Bullfighters Only, and it’s what makes the competition so much fun for the combatants and fans alike. Webster is just 24 years old, but he’s a veteran. He proved Sunday that the streets leading to Bullfighters Only’s future are heading in the right direction.